Manage receivables and collect more efficiently online. We handle the hard things like integrations so that you can have an automated process. Security is difficult for any size organization. We handle security and compliance to reduce your exposure. We make the transition to accepting Credit Cards and online payments as easy as possible. 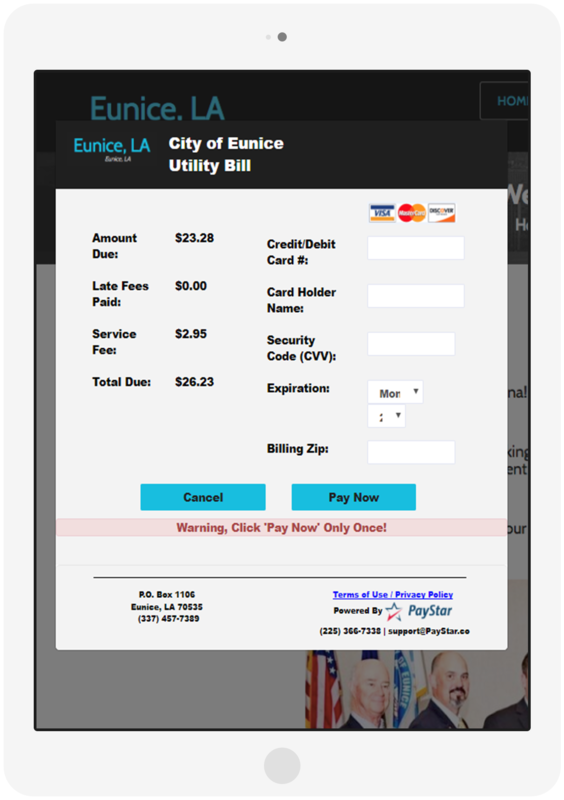 Bill presentment and online collections made easy for utility companies of all sizes. From local municipalities to state entities, we collect fines, fees, tickets, taxes and much more. We have experience many benefits from using PayStar for card payments. The initial setup was easy and our customers love it. PayStar provided a seamless transition when we started doing business with them and always makes themselves available to me and my staff. There are not many vendors you can depend on... you are a problem solver and I appreciate that. Customer service is tops. PayStar has brought us into the 21st century with ease. We would recommend to any business or municipalities looking to get into the credit card payment options. Easy to work with and get in touch with. Shocked at how many people have starting using it so fast. The feedback from our customers is that it is very convenient. by Office Admin, Rural Water Dist. It is a very easy program to learn. We haven’t received any complaints from our customers. by Office Manager, Water Dist. 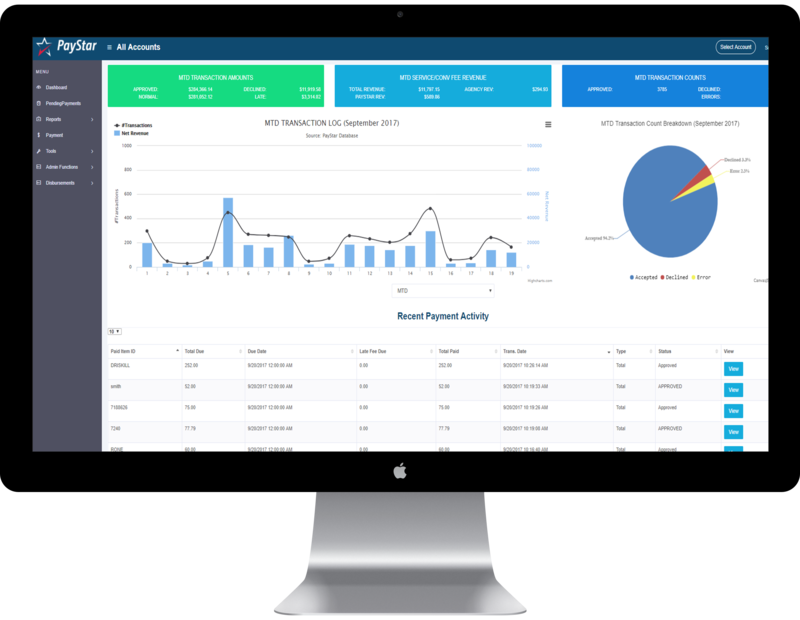 The dashboard gives you real-time access to payment information and actionable insights. We connect our platform to your internal system or third party management system to create a seamless and deeply integrated collections process. Currently integrated with 30+ billing or case management systems, we will work closely with you office to find the best solution that meets your specific needs. Multiple options for presenting receivables to your customers online and lead into online payment. 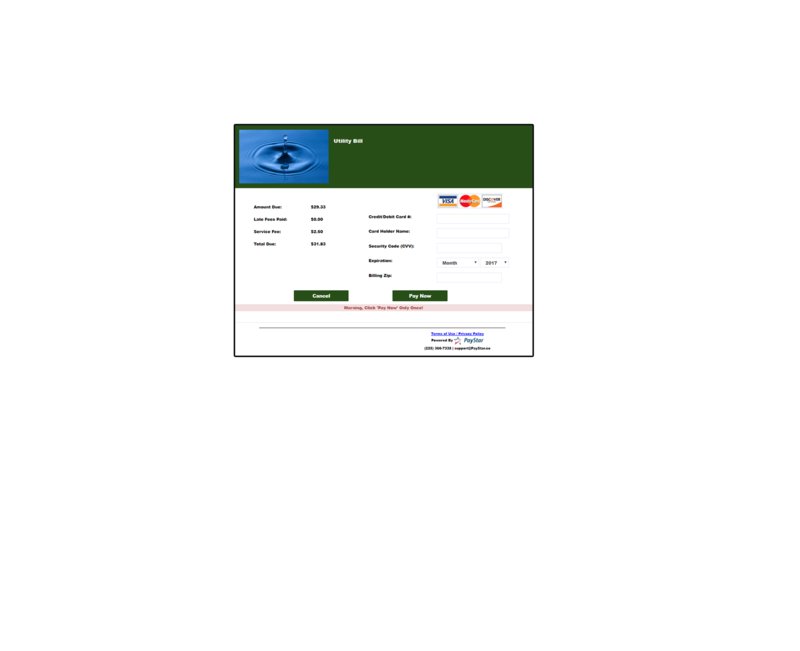 Allow customers to easily pay with credit or debit card online without creating an account. A non payment related value add feature to find amount owed, due date, late fees, other information. Detailed reporting allows for custom date ranges and filters to help with day to day management and reconciliation. The central hub for managing payments, displaying all transactions, and quick access to revenue. Our one of a kind software allows for many items to be customized from data displayed to customers to reporting.